Peter (Greek: Πετρος, "rock") also called Simon (Cephas) Peter is one of the twelve apostles of Jesus. He is often talked about in the New Testament. Most of what we know about Peter comes from the Bible. It is not known when Peter was born. But the date of his death is about the year 64 C.E. He died by being nailed to a cross in Rome. This type of death is called crucifixion. There is a legend that says that Peter asked to be crucified upside down, as he felt unworthy to die as Jesus did. Most historical sources only say he was crucified. The Roman Catholic Church, Eastern Orthodox, Oriental Orthodox, Lutheran Church and Anglican Communion, consider Simon Peter a saint. Roman Catholics believe that the Pope is Peter's successor. For this reason, he is the rightful head of all other bishops. Eastern and Oriental Orthodox also recognise the Bishop of Rome as the successor to Saint Peter and the Ecumenical Patriarch sends a delegation each year to Rome to participate in the celebration of his feast. In the Ravenna doumernt of 13 October 2007 the representatives of the Eastern Orthodox Church agreed that "Rome, as the Church that 'presides in love' according to the phrase of St Ignatius of Antioch (To the Romans, Prologue), occupied the first place in the taxis, and that the bishop of Rome was therefore the protos among the patriarchs. They disagree, however, on the interpretation of the historical evidence from this era regarding the prerogatives of the bishop of Rome as protos, a matter that was already understood in different ways in the first millennium." 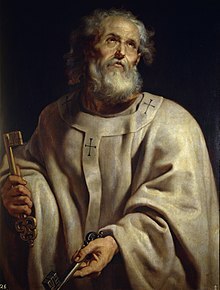 Saint Peter was the first leader of an early Christian community for at least 34 years. At that time the word Pope or "Papa" was not used to name the leader of the Roman Catholic Church. At that time there was only one Christian Church. Later, the Roman Catholic Church would say that Peter was their first Pope. The remains of St. Peter are believed to rest in Vatican City. ↑ ""Ravenna Document" of 13 October, 2007". http://www.vatican.va/roman_curia/pontifical_councils/chrstuni/ch_orthodox_docs/rc_pc_chrstuni_doc_20071013_documento-ravenna_en.html.